Apterae in spring populations of Capitophorus elaeagni on the primary host are pale green. Their abdominal dorsum is reticulate or sculptured. Each of abdominal tergites I-IV usually have 2 spinal, 2 pleural and 2 marginal hairs (cf. Capitophorus similis which has 4 spinal, 4 pleural and 6 marginal hairs on each of tergites I- IV). The siphunculi are cylindrical or tapering and are dusky to dark at the apices (cf. Capitophorus carduinus which has siphunculi which are not dark at the apices). 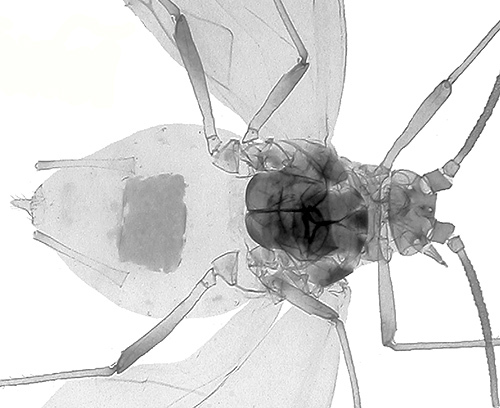 The body length of wingless viviparae on the primary host is 1.9-2.5 mm. Wingless viviparae on the secondary host (various Compositae) are greenish white to yellowish green with dark tips to the siphunculi. 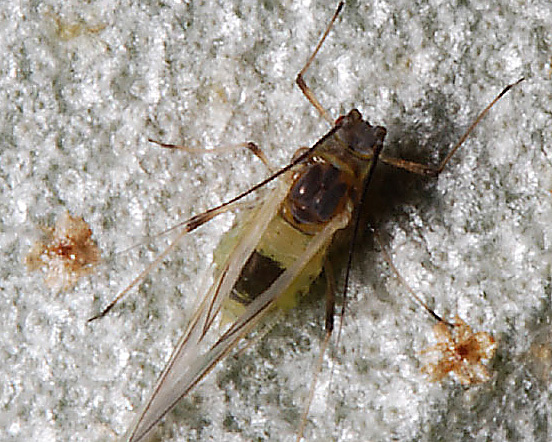 The body length of wingless viviparae on the secondary host is 1.4-2.5 mm. Winged viviparae produced on the primary host have a black head and thorax, black antennae and a blackish dorsal abdominal patch. Note: our identification of these aphids as Capitophorus elaeagni was not checked microscopically. Blackman (2010) indicates that the sexual phase of Capitophorus elaeagni that occurs on Elaeagnus in continental Europe has not yet been recorded in Britain, casting doubt on our identification. It could instead be Capitophorus similis which host alternates between Elaeagnus and Tussilago or Petasites. That said, we observed these forms in the south coast which, if sexual forms of Capitophorus elaeagni occur in Britain, is the most likely place to find them. The clarified slide mounts below are an adult viviparous female Capitophorus elaeagni : wingless and winged. 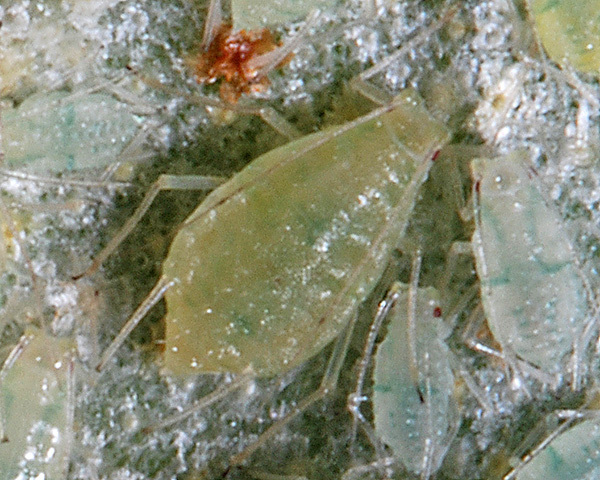 The common oleaster aphid host alternates from oleaster (Elaeagnus) or sea buckthorn (Hippophae) to various thistles and daises (Asteraceae). Capitophorus elaeagni is found over most of the temperate, and warm temperate, parts of the world. Capitophorus elaeagni has been recorded from 8 Elaeagnus species, and 1 Hippophae species (Hippophae rhamnoides =Elaeagnus rhamnoides, sea buckthorn). Blackman & Eastop list 10 species of aphid as feeding on oleaster (Elaeagnus species) and/or sea buckthorns (Hippophae species) worldwide, and provide formal identification keys. 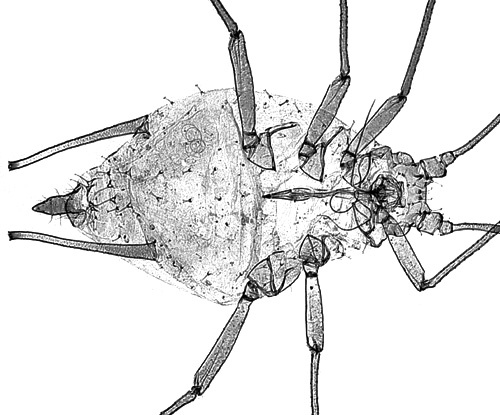 Of those aphid species, Baker (2015) lists 4 as occurring in Britain: Capitophorus hippophaes, Capitophorus elaeagni, Capitophorus similis and Capitophorus pakansus.